Armageddon 2000 Gordon McGill Sci Fi. Book is in good condition, all pages intact. 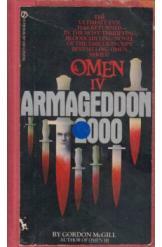 Damien Thorn - the son of Satan - was slain, destroyed forever by the sacred dagger of Armageddon. Unbeknownst to his enemies, however, Damien had sired a son of his own, and now this new scion of hell rises to bring the world under his grandfather's heel. Book 4 of the Omen series.